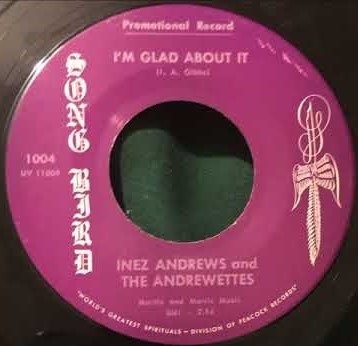 Discovering that this great 1965 gospel record by Inez Andrews and the Andrewettes is, at long last, on youtube has prompted memories of when I first heard it - on the double album Black Gospel, released in the UK in 1985 to coincide with the book of the same name by Viv Broughton, and presumably compiled by him. The book was updated in 1996 as Too Close to Heaven, with a little more about British gospel in the intervening years, and linked to a documentary series of the same name made by Channel Four: details here, although be warned it seems to be priced with institutions in mind. ... a taste of what is known as the golden age of gospel (in reality, several golden ages segued) that extended through the 1940s, 50s and 60s ... phenomenal, extravagant years in the development of black gospel music. Post-war, the so-called 'gospel highway' was opening up throughout the United States and a multitude of giant voices travelled its tortuous route from one programme to another. In a sense, the journey took place underground. Out of all the music created by black America - blues, jazz, R&B, soul and gospel - it's the latter that has remained most consistently hidden from history. While a handful of its illustrious sons and daughters, like Sam Cooke and Aretha Franklin, found fame and fortune (and often personal tragedy) by toning their act down and crossing over to the commercial limelight, gospel itself remained stoic and defied the world and its hollow overtures. The result was an utterly unique form of vocal music - breathtaking in its spiritual and emotional scope. So much so that audiences and congregations were frequently 'slayed in the spirit' ... overcome by the intensity of the moment. Indeed, at one time in New Orleans, Archie Brownlee and the Five Blind Boys were required to post a Peace Pond with the Mayor's office because they were overloading the local hospitals with comatose saints. These twenty eight recordings capture much of that extraordinary fervour. The popular misconceptions that dismiss gospel as a tambourine shaking, holy-rollering spectacle don't match with the harsh and passionate beauty that is heard here. This is the real thing, with few concessions to popular taste, declaiming righteous fire in no uncertain terms. Here are the two contributions from Inez Andrews: I'm Glad About It and Standing in the Need of Prayer, orignally released on Peacock's Songbird subsidiary. Both are passionate performances that still feel controlled, crafted, the overflow of emotion coming at precisely the right moments. In 1961 Inez shook the gospel world by leaving the Caravans [whom she had joined in 1957] and formed her own group, the Andrewettes (Elaine Davis, Mildred Span, Elizabeth Dargan). In 1963 Songbird Records ... released Inez Andrews And The Andrewettes’ The Need Of Prayer album and the following year Letter To Jesus. The albums were excellent yet times were hard for the group. Said another one-time Andrewette, Josephine Howard, "Inez and me liked sausages. We were so poor we’d have to split halves; she’d like hers boiled, I’d like mine fried." After the group’s tour of Europe in 1965 the Andrewettes struggled on for a period before disintegrating. Inez briefly returned to the Caravans before going solo in 1967 ... in 1970 Inez enjoyed an unexpected smash hit. Her producer, Gene Barge (who pop historians remember best as Daddy G, the sax-playing contributor to Gary US Bonds million-sellers) ... told Inez that she needed another song to complete the album she was working on. ... "I said, 'I don’t have time to learn anything new, so we’ll sing what I know.' After we went over, I don’t think he particularly liked it, but I did, and I was the artist so I took advantage of it." The song that she came up with was a gospel oldie ... Lord, Don’t Move That Mountain [which] topped gospel playlists everywhere and crossed over to the R&B singles charts where it peaked at number 48 in 1973. 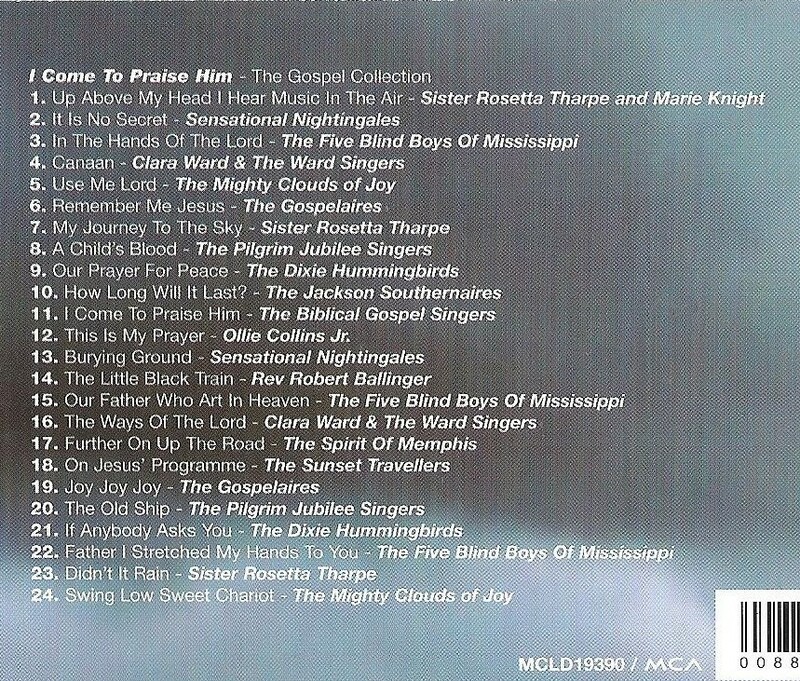 I'm assuming Mr Broughton personally sequenced the Black Gospel album, known to me via the cassette I often played in those dear dead Walkman days, which has the muted celebration of the Sensational Nightingales' It is No Secret (later covered by Elvis) lifting you gently immediately after the luxurious pain of their New Burying Ground, the latter notable not only for the astonishing vocal chord-shredding performance by June Cheeks but the backing. The Black Gospel compilation also features a song recorded in 1955 for American Decca, the infernally catchy - if that's really the adverb I want - Who Rolled the Stone Away? by Marie Knight, backed by the Sam Price trio. She is also featured duetting with Sister Rosetta Tharpe on Up Above My Head, too well known to need embedding here; you can find it on numerous compilations. But allow me to note my recent delight at learning that the bass player with Price's group for the Up Above My Head session was the great Pops Foster, who propelled the Luis Russell Orchestra to glory on Panama, one of the greatest jazz records ever made. 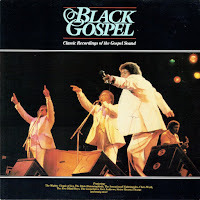 You can find a complete tracklist for the Black Gospel double album on the discogs website here. 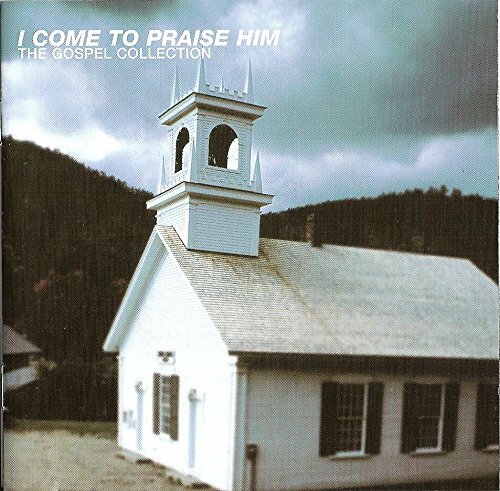 The bad news is that it has never been released on CD, to my knowledge; the good, or goodish, news, however, is that a CD entitled I Come to Praise Him duplicates many of the choices. 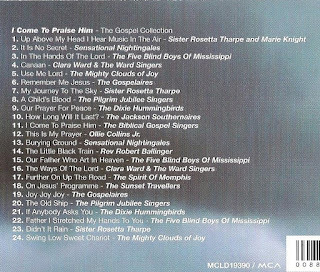 Drawn from the extensive archives of the MCA, Decca, Peacock and ABC labels, this set is an introduction to the work of some of the key gospel groups and vocalists that mined the rich seam between the 1930s and the 1970s, creating the template for much of what is now described as soul or R&B. Below is the tracklisting; click to make bigger if needed. The most significant omissions are the two Inez Andrews sides and Marie Knight's Who Rolled the Stone Away?, which I have recently tried to find without success on CD, although I understand that there are soon to be official downloads of much of her Decca material. Luckily - again, if that's the adverb I really want - the Pilgrim Jubilee Singers' disturbing A Child's Blood - a recitation, as the rest of the group sing Precious Lord, about a daughter whipped to death for daring to say to her father that she knew Jesus - has been included. Andrews' version of Stand By Me, a world away from Presley's, is worth seeking out. You can find it on spotify but not youtube at present. I have written at greater length about a play featuring June Cheeks in one of the posts linked to below. Neil McKay's radio play about Sam Cooke, A City Called Glory, is a superb piece of work. Cheeks was briefly in the Soul Stirrers alongside Cooke, his polar opposite in terms of singing styles and, it seems, outlook. McKay employs Cheeks as narrator or choric figure, compelled to tell Sam's story, going over and over in his mind the circumstances which led to his death, buttonholing strangers as he tries to make sense of it all. Cheeks was one of the singers "defied the world and its hollow overtures", as Viv Broughton put it. He never crossed over and became a preacher in tandem with his singing, and in the play is the touchstone for Cooke as he wavers between the two worlds. McKay's masterstroke, however, is that he is split into two as the play approaches its climax: at once a voice in Cooke's own head and the real man, still desperately trying to make sense of what happened on that fateful night Cooke was shot.